LED outdoor lighting is the energy efficient, cost effective alternative to halogen lighting and as well as being cheaper to run, outside LED lights are also low maintenance and can last up to 7 years or more before you need to think about replacements. Although they are low energy, LED garden lights are still extremely powerful and our LED flood lights are the perfect choice for illuminating landscape features including garden ponds and decking. At Fibre Optic FX Ltd, we stock a wide range of LED lighting products that can help prevent accidents, whilst simultaneously protecting your property against unwelcome visitors during the night. With LED track lighting, you can safely illuminate the stairs outside your home which helps to prevent trips and falls when leaving or entering the front or back of your house. Our LED flood lights will help to deter intruders and will keep the exterior of your home brightly lit whenever they are triggered by movement. Other products such as our LED post lights are ideal for illuminating garden paths and will also help to prevent nasty trips during the evening and throughout the night. If you have recently invested in a new barbecue or a recent flowerbed display, or you have just had a new patio installed, our LED deck lights and landscape lighting are the ideal solution for bringing your new garden features to life. Whether you decide on a bright white lighting option, or a multi-coloured RGB LED lighting solution, our outdoor LED lights will bring out the best in any exterior design project. 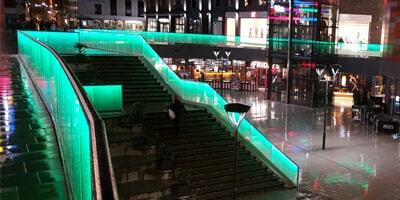 Our exterior LED lighting products are also completely weatherproof.